Gov. 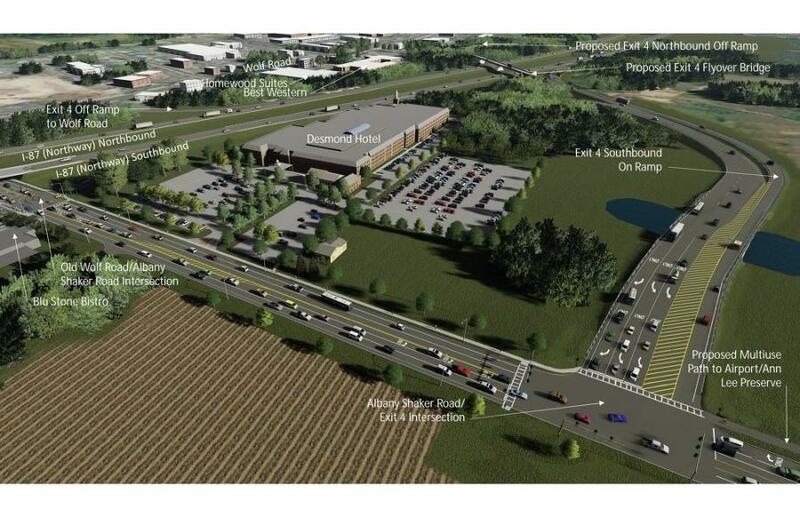 Andrew M. Cuomo announced that the contract for the transformative $50 million Albany Airport Connector at Exit 4 of the Adirondack Northway (Interstate 87) in Colonie, Albany County, has been awarded. Field and surveying work are currently under way and major construction is expected to begin this winter. The project will be completed by the spring of 2020. "The Capitol Region is an international gateway for tourism and commerce, and this project will not only transform the airport but make traveling and commuting easier for visitors and residents alike," Cuomo said. "Coupled with our historic investment in Albany International Airport and airports all across upstate New York, this connector will help improve the quality of life for people across the Capitol Region while enhancing economic development opportunities." "We are building upon our significant investments in the Capitol Region and helping to transform the travel experience at Albany International Airport," said Lieutenant Gov. Kathy Hochul. "Infrastructure improvements provide a major boost to our economy, creating good-paying jobs and improving safety. The new connector project will help to reduce commute times and ensure visitors to the Capitol Region have convenient access to all our state has to offer." The Airport Connector project, overseen by the State Department of Transportation, will ease traffic congestion and provide a more direct route to the airport for both commuters and visitors to the region. The project also complements a $42.1 million project, which includes $22.1 million in state funding, already under way to modernize Albany International Airport. The project, which was first announced by Gov. Cuomo in August 2018 with expected completion in spring 2020, was awarded as part of the Governor's $200 million Upstate Airport Economic Development and Revitalization Competition. With initial survey work for the project now under way, the contractor — Lancaster Development and Tully Construction Co. — will procure equipment and materials and establish a field office. Clearing and grubbing, earthwork and drainage work for the new ramps, foundation work for the new flyover bridge and preparation for utility relocations is expected to begin this winter. Construction will be arranged to adhere to Gov. Cuomo's Drivers First initiative to minimize impacts to Northway traffic. There will be few anticipated traffic impacts during the initial months of the project, with most of the work occurring off-road beyond the Northway and Albany-Shaker Road. Work occurring later in the project timeline that may affect travel lanes will be scheduled to occur when traffic volumes are lower. On the northbound side, the on-ramp adjacent to the Times Union building will be extended all the way to Exit 5 for Route 155, creating a longer auxiliary lane that will make it easier for drivers to merge onto the northbound Northway and to depart the highway at Exit 5. A noise wall is planned to be built on the northbound side between Exits 4 and 5. The project also will convert the existing northbound Exit 4 off-ramp to allow for right-turn only maneuvers onto Wolf Road. 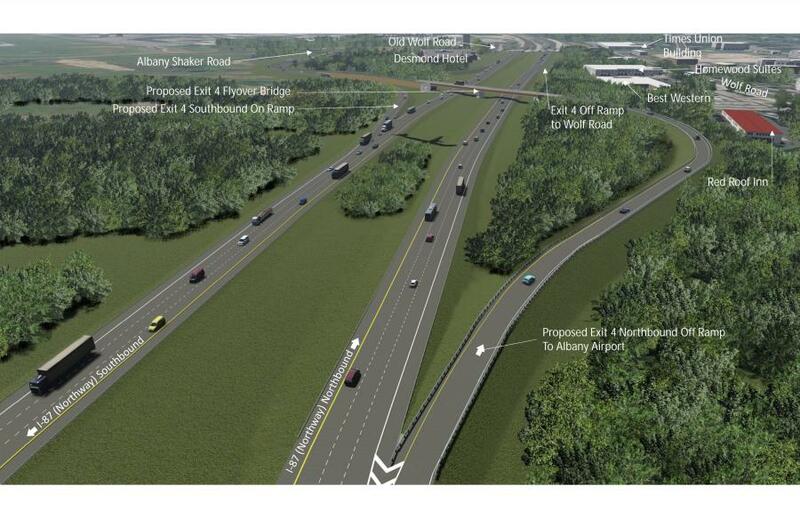 The project also will enhance connectivity for pedestrians and bicyclists by providing sidewalks on the south side of Albany Shaker Road between the connector road and Wolf Road, as well as a shared use path between the Albany International Airport and the connector road. Construction of the airport connector road also will free up large tracts of commercially zoned parcels for redevelopment and improvement by the private sector. By using the best-value procurement process — which considers bidding contractors' proposed cost, technical expertise, past performance and proposed work schedule — NYSDOT is accelerating the project, which is scheduled to be completed by the spring of 2020. Funding for the anticipated $50 million project was included as part of Gov. Cuomo's $100 billion Infrastructure Renewal Plan.